The climbers and I started hiking at 5 AM that morning in the dark. This was the third day of an assignment I was shooting for Climbing Magazine in the Black Hills of South Dakota. It had already been a little rough with two days of difficult weather. I was in desperate need of good light and the bright stars were a good indicator that the dawn would be clear. Larry Shaffer and Cheryl Mayer had been recommended to me as the trad masters of the Needles, and they didn’t disappoint. Larry soloed the short first pitch (meaning he climbed without the use of a rope or any gear to protect him in the case of a fall) of East Gruesome Spire as I moved into position to shoot higher up in the gulley. In the top of the gulley it was freezing cold and the wind was howling. I was shaking so violently I could barely keep the camera steady. My plan was to shoot East Gruesome Spire from the side at first light as the climbers ascended and then jumar to the top of East Gruesome to shoot across at the Eye Tooth. Though only rated 5.7, the Eye Tooth was spectacularly exposed and would give a very good feeling for what it was like to climb in the Cathedral Spires. Around 8:30 AM I started jumaring to the top of East Gruesome Spire. My sixty-meter static rope hung free from the gently overhanging wall for the first hundred and sixty feet. I wanted to get in position as quickly as I could so the light wouldn’t get too harsh on the Eye Tooth. Thirty feet from the top I looked up to see my rope, twelve feet above me, bent over a large quartz crystal pointing straight out from the wall. My first reaction was to push off the wall and get the rope off the crystal. As I leaned out from the wall I noticed my rope seemed strangely thin where it ran over the crystal. I was looking at frayed core material. From my perspective it appeared I was hanging from one third of the rope’s sheath! 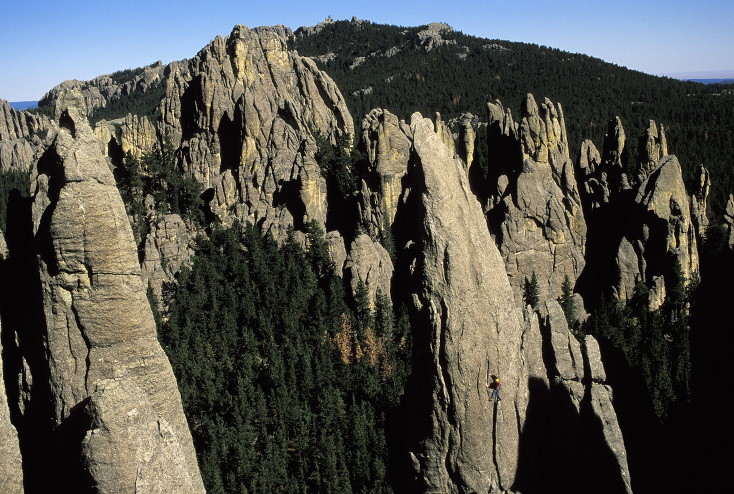 Above: Michael Clark’s partially severed static line after a very close call in the Cathedral Spires in South Dakota. I wasn’t panicked. I was stunned. It was sobering to think that my life would be over so quickly. I immediately started to pray. One third of a sheath couldn’t hold me for more than a few seconds. I could already see my body falling away from the wall and I was anticipating how it would feel. Gravity would engage instantaneously. My thirty-five pound camera pack would act as ballast. Upon impact one hundred and eighty feet below, the camera pack would break my back and slam my head and feet onto the granite slabs. I would have two seconds at most. And I would be looking at the blue sky above me the entire time. I could hear the dull thud of my landing. And I was praying as I have never prayed before, certain that this was my time to die. I tried to call up to the climbers, who were still on top. I had to forcibly clear my throat just to speak. When finally I yelled, it was with noticeable urgency. I asked them to lower a rope to me as quickly as they could and put me on belay. I remember Larry said, “give me a moment, this could take a little time.” I shouted back with a cracked and broken voice, “lower the rope NOW! I’ll tie in while you are putting me on belay.” Larry’s face popped over the top and he understood the situation immediately. I can’t remember how long it took to get the rope down to me. It felt like two or three minutes. I held myself as still as I could on the holdless wall waiting for the rope to break. My mind was racing and I realized I was praying out loud. Verses I had memorized from the Bible were floating through my mind. “… to live is Christ, and to die is gain.” (Philippians 1:21) I can’t say I felt peace. Endorphins and adrenaline kicked in. I was on autopilot, praying without even thinking, confessing my sins and preparing myself for the end. The rope end dropped just in front of my face. I made the fastest tie-in of my life, at the same time concentrating on my breathing to calm myself down. Once secured, I jugged up and past the cut. When I got to the cut I realized that some of the core was still intact but I just kept going. On top, Larry and Cheryl were looking at me, waiting for a reaction. My nervous comments gave away how I felt. Little else was said. Then they moved ahead with the plan, rappelling their ropes to start up the Eye Tooth. It appeared that the crystal had cut half way through the core. 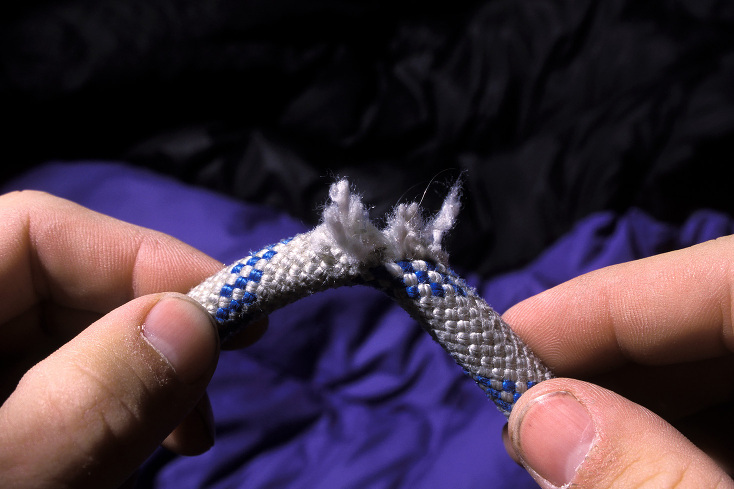 I would later find out, after cutting the rope open that I was hanging from three of the seven strands of the core. 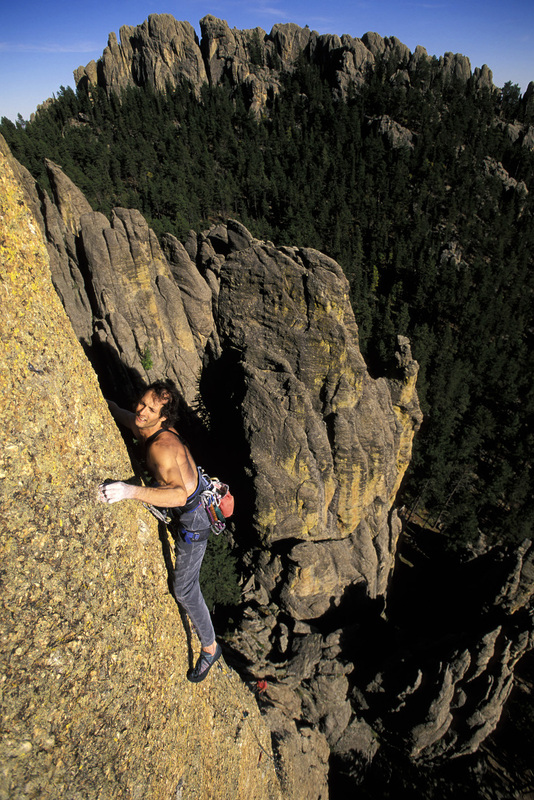 Above: Cheryl Mayer on the daunting and exposed Eye Tooth (5.8+) in the 4/5 gulley of the Cathedral Spires in Custer State Park in the Black Hills of South Dakota. It was not until I was alone that I broke down. I started praying again, thanking God for His mercy. I must have prayed for twenty minutes or more. It seemed to calm me. And I knew I had to keep it together and concentrate on the images. Taking photographs was a diversion. I started to get excited about the images and it forced me to think about composition, exposure, and focus instead of what had just happened. When it came time to rappel I was gripped. My faith in ropes had just taken a serious beating. I checked the anchors at least five times before I leaned back over the edge and once I was on the ground I felt a huge release. We continued shooting for the rest of the day but thankfully the architecture of the Spires was such that I could get above the climbers without having to get on a rope. The next few days were intense after such a close call. Flowers looked brighter, the sky bluer and life seemed surreal. I realized that every moment from here on was a gift. I no longer felt invincible. And death didn’t seem so far away as it did before. It could come at any moment. And that forced me to stop and think about what is truly important. A few days later, I was two hundred feet off the deck in the Cathedral Spires again. Needless to say it was mentally challenging. I knew the “money shots” would be from above on the second pitch in the late afternoon light. I forced myself up there even though my nerves were still frazzled. I said a prayer before I started jugging the second pitch that made everyone take notice at the belay. Once we started shooting I calmed down. I quickly realized these could be the cover shots for the article and that made me concentrate on the images. Above: Eric Sutton on the 5.12 second pitch of the Yellow Wall on Kayyam in the Cathedral Spires of Custer State Park, South Dakota. To this day, I still get nervous when I hear rope rubbing on rock. But in retrospect, it has become a blessing. Every breath is a gift. Someday we will all die. I don’t know if I am ready, but I am getting prepared. Writer’s note (from 2004): As I wrote this my heart was palpitating, my hands were shaking so much it was hard to type and I had goose bumps just remembering what it was like hanging, thinking and waiting. My shirt was soaked from sweat by the time I finished writing and I felt sick to my stomach. I was trying to put myself back there, in that situation to capture what it felt like and I was a little surprised at how well I could remember every detail of those three or four minutes.